The rubberized vinyl hand and feet poly pads can be used as the basis for activities that focus concentration, require landing markers for leaps, and hone directional orientation. Commonly used as a teaching tool for gymnastics, dance, theater, or other disciplines requiring location indicators. Available in sets of 12 (six rights and six lefts). 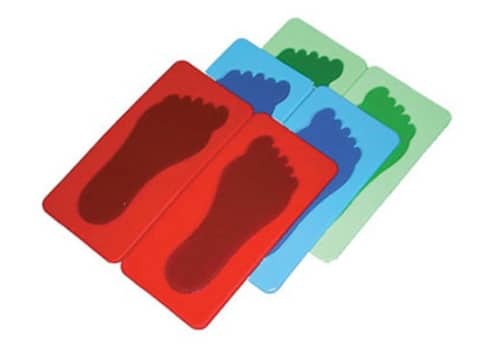 The rubberized vinyl feet poly pads can be used as the basis for activities that focus concentration, require landing markers for leaps, and hone directional orientation. Commonly used as a teaching tool for gymnastics, dance, theater, or other disciplines requiring location indicators. The poly pads are tough, non-toxic and not painted or coated; colors are permanently set during the molding process. Color: Red, Blue, or Green.